In Pakistan Death Row Case, A Rare Glimmer Of Hope : The Two-Way Asia Bibi, a 50-year-old mother of five sentenced to death in 2010 for insulting Islam, has been granted a reprieve — for now. Pakistan's Supreme Court will hear her appeal, but no date has been set. 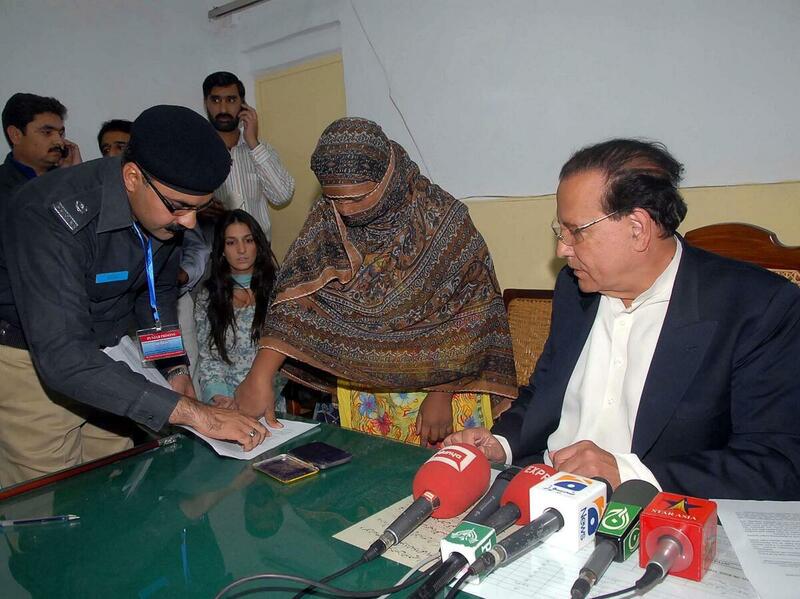 At the jail where she was held in 2010 after being sentenced to death for blasphemy, Asia Bibi affixed her thumbprint as signature on a mercy petition to Punjab's provincial governor, Salman Taseer, at right. Taseer had expressed support for Bibi and was assassinated two months later. Pakistan's Supreme Court has stayed the execution of Asia Bibi, a 50-year-old Pakistani mother of five who was sentenced to death by hanging for insulting Islam. On Wednesday, the court agreed to hear her appeal. Bibi's death sentence was handed down by a lower court in 2010 for committing "blasphemy." The BBC quotes her lawyer telling reporters outside the Supreme Court: "The execution of Asia Bibi has been suspended and will remain suspended until the decision of this appeal." The BBC says no date has been set. A member of Pakistan's minority Christian community, Bibi was the first woman ever to be convicted of blasphemy in Pakistan. The charges against her — which she has always denied — apparently stemmed from a squabble over drinking water. "The allegations against Bibi date back to June 2009, when she was labouring in a field and a dispute broke out with some Muslim women. Asia Bibi's case has attracted international attention. 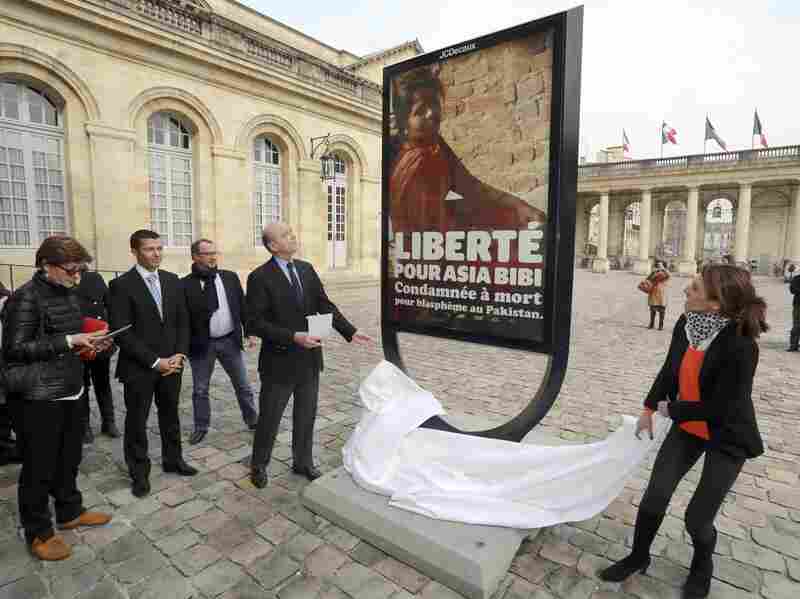 In March Alain Juppe, near left, mayor of the French city of Bordeaux, unveiled a poster in the city hall courtyard in honor of Asia Bibi. A similar poster is in front of the city hall in Paris. She was asked to fetch water but the women objected, saying that as a non-Muslim she was unfit to touch the water bowl. A few days later, the women went to a local cleric and made the blasphemy allegations." Over the years, her case has elicited international outrage from human rights groups and others. Pope Benedict called for her release in 2010 and Pope Francis met with her family in April. Anne Hidalgo, the mayor of Paris, declared Bibi an honorary citizen of the French capital in March. David Saperstein, the U.S. Ambassador-at-Large for International Religious Freedom, tweeted that today's Pakistan Supreme Court move was a "significant step towards justice." In 2011, both the Punjab provincial governor and Pakistan's minority affairs minister were assassinated after expressing support for Bibi and opposition to the country's harsh blasphemy laws. Critics of those laws say accusations of blasphemy are too often used with impunity as a way to persecute minorities or settle scores. The Pakistani newspaper Dawn reported in 2013 that more than 1,200 people had been charged under the laws between 1986 and 2010. No one has been executed by the state for committing blasphemy. But even for those acquitted, released or never put on trial, the accusation itself can be damage enough.